Many thanks to GSMA for their kind invitation to speak at the 2012 World Mobile Congress (MWC12) in Barcelona, Spain. GSMA is formally launching its Disaster Response Program at MWC12 with an inaugural working group. “The Disaster Response programme seeks to understand how mobile operators can most effectively support each other and improve resilience among networks in disaster scenarios, and identify how the mobile industry can best help citizens and humanitarian organisations on the ground following a crisis.” Below is the presentation I plan to give. When disaster strikes, access to information is equally important as access to food and water. This link between information, disaster response and aid was officially recognized by the Secretary General of the International Federation of the Red Cross and Red Crescent Societies in the 2005 World Disasters Report. Since then, disaster-affected populations have become increasingly digital thanks to the widespread adoption of mobile technologies. Indeed, as a result of these mobile technologies, affected populations are increasingly able to source, share and generate a vast amount of information, which is completely transforming disaster response. Take the case of Haiti, for example. Within 48 hours of the devastating earthquake that struck Port-au-Prince in 2010, a dedicated SMS short code was set up to crowdsource information on the urgent needs of the disaster-affected population. This would not have been possible without the partnership with Digicel Haiti since they’re the ones who provided the free SMS short code that enabled anyone in Haiti to text in their most urgent needs and location. This graphic depicts the words that appeared most frequently in the text messages that were received during the first two weeks after the earthquake. Obviously, the original text messages were in Haitian Creole, so volunteers from the Diaspora translated some 80,000 SMS’s during the entire 3-month operation. From these, the most urgent life-and-death text messages were identified and geo-located as quickly as possible. 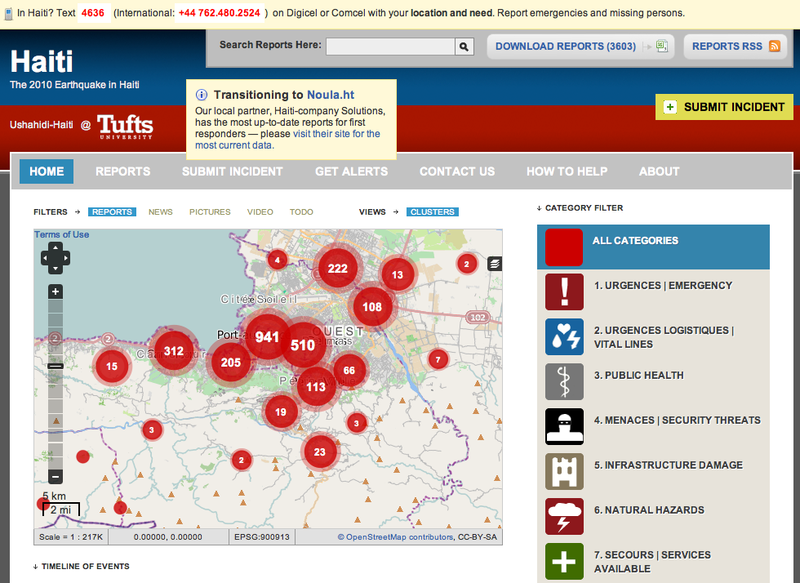 The result was a live crisis map of Haiti, which became the most comprehensive and up-to-date information available to the humanitarian community. In fact, one first-responder noted that the live map helped them save hundreds of lives during their search and rescue operations. 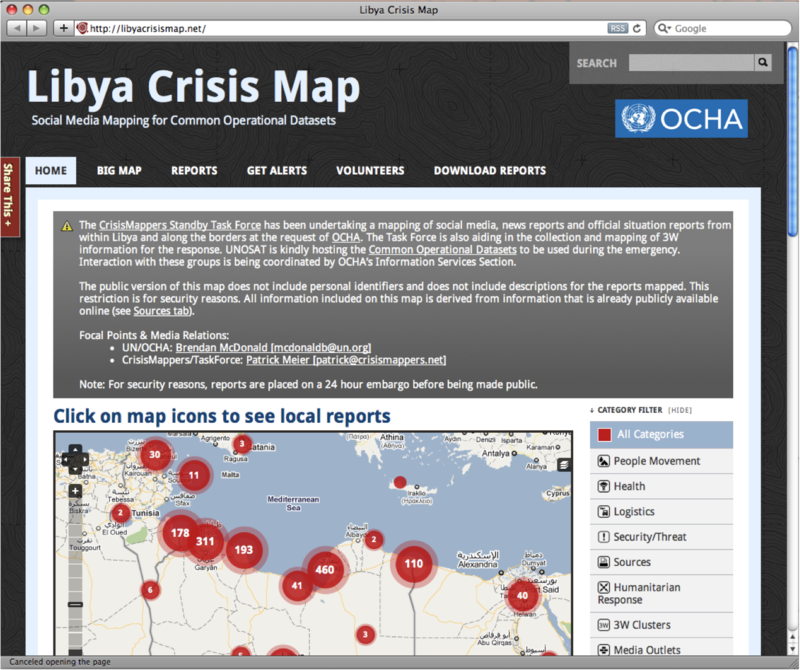 Live crisis maps are critical for disaster response because they can provide real-time situational awareness, like this official UN Crisis Map of Libya. Because the UN Office for the Coordination of Humanitarian Affairs (UN OCHA) did not have information management officers in-country when the crisis began to escalate, they turned to the crisis-affected population for real-time information on the rapidly changing situation. Indeed, a lot of local and relevant user-generated content was already being shared via Twitter, Flickr and YouTube. The result was this crowdsourced social media map which was used not only by OCHA but also by the World Food Program and other humanitarian organiza-tions. Needless to say, the majority of the rich, multi-media content that populated this map was generated thanks to mobile technology. Humanitarian organizations are not the only groups using mobile technologies and crisis mapping platforms. Indeed, the mainstream media plays an instrumental role following a disaster. Their ability to widely and rapidly disseminate information to disaster affected populations is absolutely critical for disaster response. And they too are turning to live crisis maps to do this. Just a few weeks ago, Al-jazeera launched this live map to document the impact of the snowstorm emergency in the Balkans. The map became the most viewed page on the Al-jazeera Balkans website for several weeks running, a clear testament to the demand for this type information and medium. This is actually the third time that Al-jazeera has leveraged mobile technologies for crisis mapping. Just two short months ago, we partnered with Al-jazeera to run a similar project in Somalia using an SMS short code. There is no doubt that access to information is as important as access to food and water. In fact, sometimes information is the only help that can be made available, especially when isolated populations are cut off and beyond the reach of traditional aid. So while we talk of humanitarian aid and food relief, we also need to talk about “information aid” and “information relief”. Indeed, we have a “World Food Program” but we don’t have a “World Information Program” for communicating with disaster-affected populations. This explains why I very much welcome and applaud the GSMA for launching their Disaster Response Program. It is perfectly clear that telecommunications companies are pivotal to the efforts just described. I thus look forward to collaborating with this new working group and hope that we’ll begin our conver-sations by addressing the pressing need and challenge to provide disaster-affected populations with free “information rations” (i.e., limited but free voice calls and SMS) in the immediate aftermath of a major disaster. This entry was posted in Big Data, Crisis Mapping, Crowdsourcing, Humanitarian Technologies, Social Media and tagged #MWC, #MWC12, Disaster, GSMA, Mobile, Response, SMS, technologies. Bookmark the permalink. I just saw this so am probably too slow to provide comment for your talk. I never really discussed this side of what I do as were in crowdsourcing and Ushahidi for so much. But telecommunications is my background so naturally we are working on a number if initiatives in this area. Sms is but one service that the carriers can utilise to communicate with the affected populace and probably down on the list when it comes to possible services that could be used. There are variations of sms that we are exploring. One that we call “Geo-sms” is identifying phones in a specific area and sending out messages to them only. To do this we query the carrier for the phones connected to specific cell towers and then send the message to them. This saves on carrier resource as well as quickly identifies at risk numbers. This triggers another service called USSD which is a real time link to the network much like looking at your prepay balance. They select their option then select from a range of timing as to when they want it. These two services work well in small geographical areas which means we can also have an idea of where the assistance is needed. SMS and USSD have been available since GSM’s inception. Amazingly, cell broadcast has also been around since GSM was introduced, just not utilised much until disaster managers started becoming aware of its capabilities. One other service we are looking at is geo-locating the inbound calls and SMS. this is more for emergency services on a regular basis than a major disaster but it all helps. There are a couple of others but these are ones that they can set up very quickly with little effort.